We perform music written in the 1600s and 1700s for entertainments at court and for house parties, yet presented for a 21st century audience in a cabaret type style, inviting your guests into a vibrant world of music and humour that is still very much alive in Britain today. 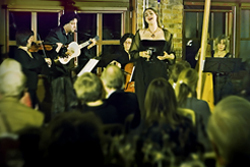 We have programmes highlighting music composed for the courts of James I and Charles I, plus programmes focussing on social music-making in Restoration and Georgian London. when the first songbooks were published for home entertainment and musicians from the theatres and opera would meet at prominent homes after work to play for friends and patrons. We have two of Britain's leading concert masters in The Frolick and their playing together could only happen in so social a meeting of musicians. We offer a song programme as the main entertainment, cabaret style, and instrumental sets to compliment for your drinks reception etc. At Aynhoe Park guests requested encores of baroque songs for dancing, and at The Middle Temple Gala Dinner 2008 guests clapped and stamped their feet in time to music written in 1608. Guests tell us that our shows make them feel as though they have gone back in time and really experienced these earlier times, and yet we are 21st-century musicians in modern clothes. For us this music is not for restaged historical enactment, it is entirely about the spirit of the time and the music - music for entertainment, humour, expression and fun! If you would like to know more about our event programmes, or to ask about something specific which you would like for your event please email us at info@thefrolick.com.